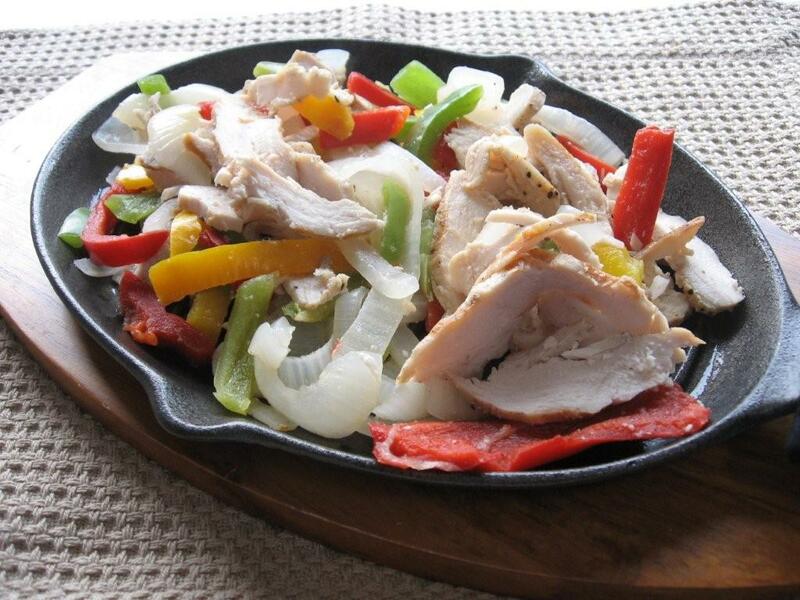 Chicken fajitas are a tasty and satisfying meal. With prepackaged spice mixes, frozen Bell pepper strips, prepared guacamole, a package or tortillas and chicken from the freezer, these fajitas can be made in short order with a minimum of fuss or bother, a perfect dish to prepare in the RV once you have set up camp. I like to marinate the meat and then grill the chicken, allow it to cool a bit and then slice it up to add to the peppers and onions sizzling in the frying pan or the fajita platter. The chicken can also be pan cooked and then cut into strips and then mixed with the peppers and onions. Prepare fajita spice mix according to the package instructions, usually a ½ cup of water. Place the chicken pieces in a plastic bag and add the marinade. Knead gently while expelling the air from the bag and close off the top of the bag. Place the bag of chicken in a bowl or pan and marinate in the refrigerator for 4 to 6 hours, turning several times. If grilling the chicken: for gas or charcoal grills, cook the chicken over medium high heat turning and rotating every 3 to 4 minutes, about 12 to16 minutes cooking time or 170° internal. Remove from heat, cover with foil and allow to rest for about 15 minutes. Electric grills will take about 8 minutes. If pan frying the chicken: heat a small amount of oil in a heavy frying pan. Cook until browned on both sides and an internal temperature of 170°. Remove chicken from pan and covr with foil to rest 15 minutes. Slice chicken into thin strips and set aside. Spray heat heavy frying pan or fajita pan with non-stick spray. Heat over high flame. Add onions and cook and turn until onions have softened. Add peppers and cook and turn until peppers have softened. Add reserved sliced chicken and stir to combine. Cook until chicken is heated through and vegetables are tender. Remove from heat and drizzle with lime or lemon juice. 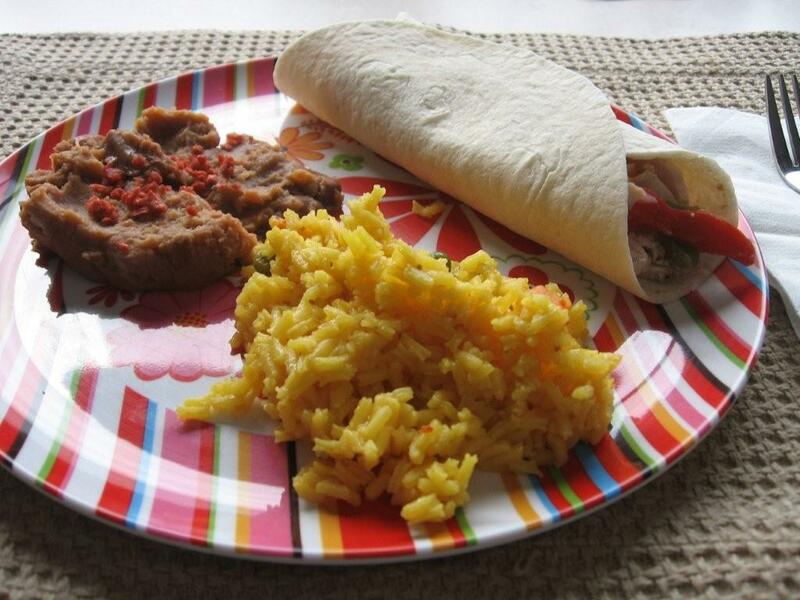 Warm tortilla in oven or microwave. Ladle portion of the chicken mixture on edge of tortilla. Add a spoonful of diced tomatoes and dollops of guacamole and sour cream. Roll up tortilla to make burrito. Serve with refried beans with bacon crunmbles and Spanish-style saffron rice.